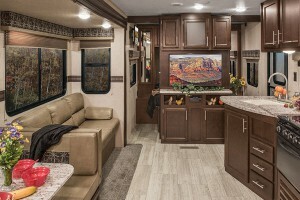 What puts an RV on the list: There are more than a few brands that sport outdoor kitchen floorplans in their campers. However, the ones we chose have the best mix of user and critic reviews, are new to provide you with the latest features, and have at least 5 outdoor kitchen floorplans so you always have a few choices to pick from once you choose the travel trailer of your choice! 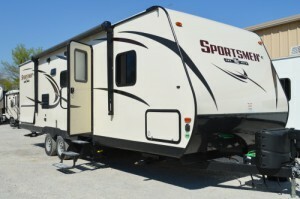 View All KZ Sportsmen Travel Trailer Floorplans! Why we recommend the KZ Sportsmen travel trailer: KZ’s latest and greatest of 2018 is the sportsmen travel trailer that features 9 floorplans with a variety of different weights and lengths to choose from, not to mention that it has 5 floorplans that feature outdoor kitchens. 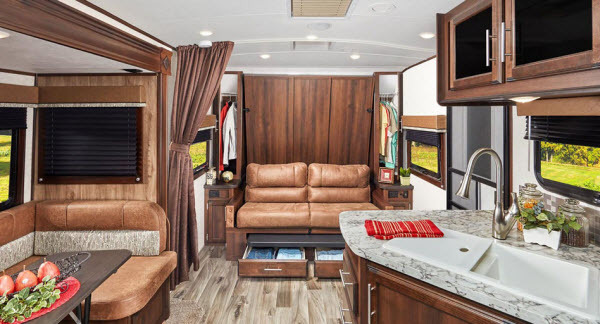 We particularly liked the Sportsmen 333BHK and the Sportsmen 282BHK but the only difference between them are the physical aspects, with consistent features in the floorplans. 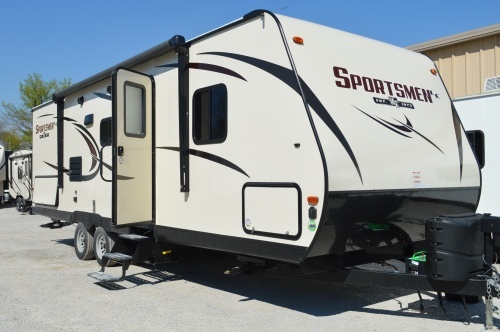 Speaking of features, the KZ sportsmen will provide you with everything you need, including a power awning and an air conditioner (13,500 BTU). All the features are there, along with a few additions such as outdoor speakers. 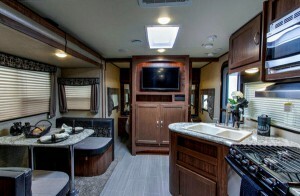 If you wish to expand this RV in the future, they have also added the options of upgrades to the Sportsmen down the line such as a 15,000 BTU air conditioner. 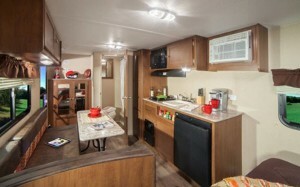 In a nutshell, it’s one of the best-in-class travel trailers with an outdoor kitchen that you can buy right now! 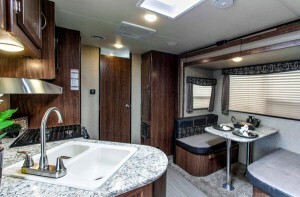 The ‘Small Family’ Travel Trailer! 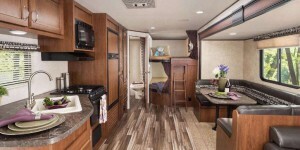 View All Dutchmen Aerolite Travel Trailer Floorplans! 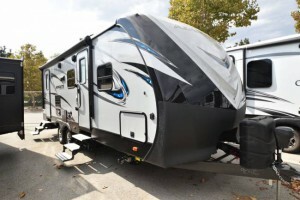 Why we recommend the Dutchmen Aerolite travel trailer: The Aerolite has been featured quite a few times in our other lists, including The Top 5 Best Travel Trailers for Campgrounds. Akin to the Sportsmen, the Aerolite also features 5 floorplans that have outdoor kitchens. We specifically recommend the Aerolite 2573BH and the Aerolite 2923BH out of these 5. It’s mostly meant for small families, but they do have bunkhouse floorplans that support a sleeping capacity of up to 8 people! 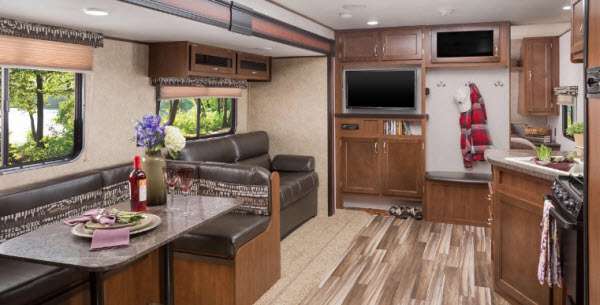 The Aerolite impresses us with its exterior durable aluminum construction, the posh, and appealing finish– giving it that luxury vibe. It’s complemented by a decent 13,500 BTU air conditioner, a comfortable jackknife sofa, and dual 6.5 inch speakers. 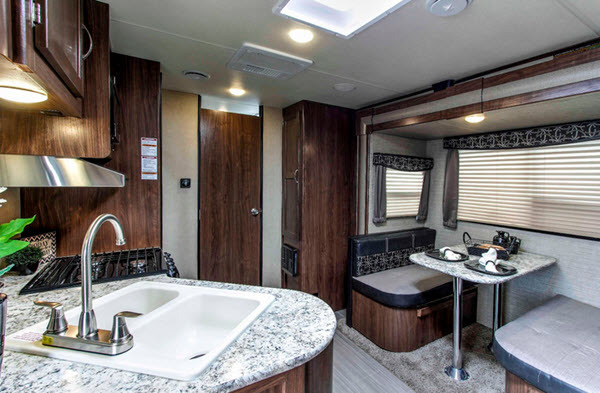 If you aim to give it a little ‘oomph’ down the road, the Aerolite can also be upgraded to a travel trailer that possesses compliance with Canadian RV standards, a fireplace, a 15,000 BTU air conditioner and many other (and better) features! 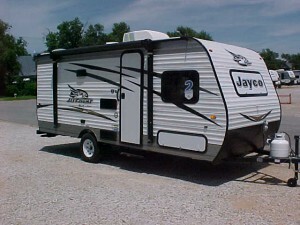 View All Jayco White Hawk Travel Trailer Floorplans! 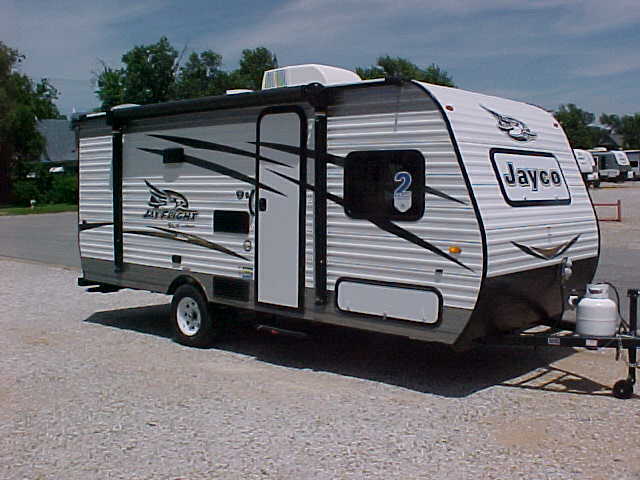 Why we recommend the Jayco White Hawk travel trailer: Jayco is one of the top companies in the RV industry, offering a plethora of brands, ranging all the way from toy haulers to motorhomes. 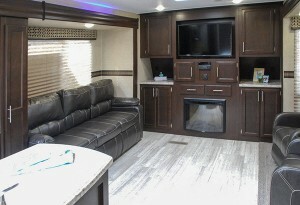 As far as travel trailers go, we really liked the White Hawk Travel Trailer as it has numerous satisfied users across the country. It features 14 floorplans of which 8 floorplans have outdoor kitchens, giving you plenty of options to choose from, differing in terms of sleeping capacity, weight and the overall footprint of the RV. We were particularly interested in the White Hawk 26RK and the White Hawk 29BH, but the other floorplans have considerably consistent feature-sets. You’ll rarely find any features that are only present on select floorplans (such as a full bedroom closet). Otherwise, it’s the same impressive hardwood cabinetry, 39-inch LED TVs ,and the same upgradability. Bottom Line? 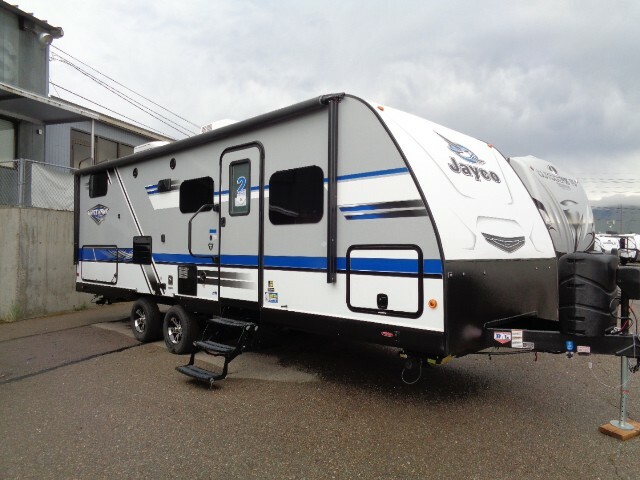 There are a few travel trailers that can provide the level of convenience at its price range that the Jayco White Hawk Travel Trailer can! 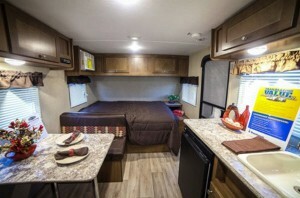 Why we recommend the Jayco Jay Flight SLX travel trailer: The White Hawk’s versatile brother, the Jay Flight SLX features 17 floorplans of which 5 have outdoor kitchens. Depending on the floorplan you choose, you’ll be able to tow this with any half-ton vehicle or a truck. It’s versatile, as you don’t find a lot of travel trailers whose footprint ranges from a miniature 16 feet to a massive 36 feet. We recommend checking out the Jay Flight SLX 284BHS and the Jay Flight SLX 294QBS floorplans. In terms of features, the Jay Flight SLX has standard equipment, along with a few packages that add a variety of fun features. It also has a separate list of standalone upgrades, which is not something you see every day! 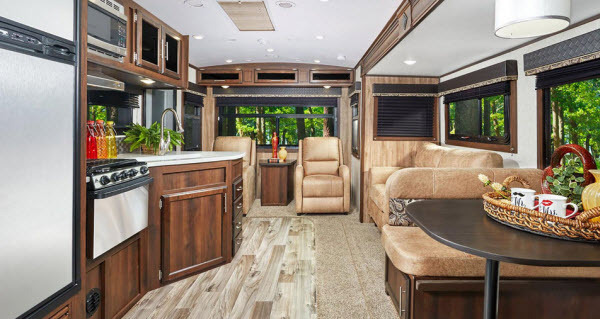 Some of these features include a power awning, maple-style cabinet doors, multimedia sound system with audio jacks and bluetooth, oven, 300-pound rated bunk beds and J-steel jackknife sofa. Why we recommend the Dutchmen Aspen Trail travel trailer: The Dutchmen’s Aspen Trail Travel Trailer has 11 outdoor kitchen floorplans out of the total 36. Despite belonging to a lower price point, it sports some of the best features in a myriad of different ways. 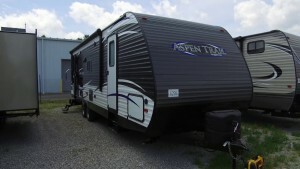 Check out the Aspen Trail 2340BHS and the Aspen Trail 2710BHWE. 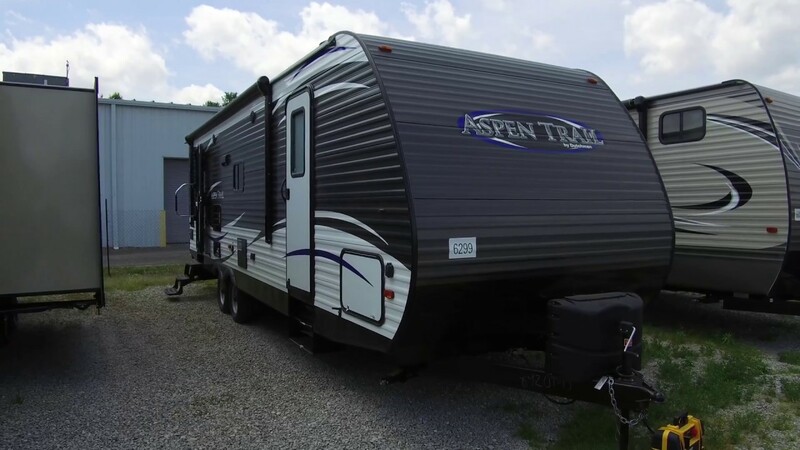 The Aspen Trail has a ton of amazing features, and if you’re looking for premium, the Aspen Trail also provides optional upgrades. If you want to give it’s 8,000 BTU air conditioner a boost, there’s options to replace it with a 13,500 BTU model. Similarly, if you would love the best awning available, upgrade the manual to a power awning and you’re good to go! Its simple and yet intricately upgradable build led us to believe that the Aspen trail is a worthy addition to our list. The next time you need to set up a barbeque with ventilation, or just need to be closer to nature, look no further than our top 5 picks of the best travel trailers with outdoor kitchens! 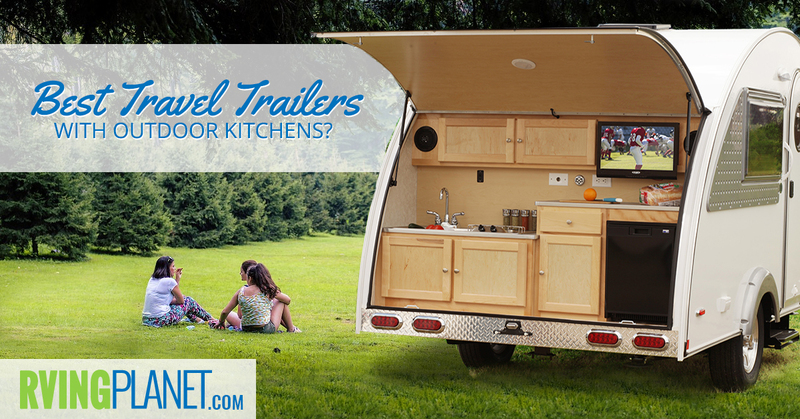 Share with us your favorite travel trailer with outdoor kitchens in the comments below!